Geminiviruses are small, single-stranded, circular DNA plant viruses, so called because each particle is composed of two partially assembled icosahedra joined to form a twinned capsid , . They infect plants and are carried by insect vectors such as leafhoppers and whiteflies . They are divided into seven genera: Mastrevirus, Bogomovirus, Topocuvirus, Curtovirus, Becurtovirus, Eragrovirus and Turncurtovirus; according to their genomic organization, the hosts they infect, the insect vectors by which they are transmitted and by genome-wide pairwise sequence identities . Geminiviruses belonging to the genus Mastrevirus are all monopartite viruses with genome sizes between 2.5 and 3.0 kb. They have as vectors different species of leafhoppers. They infect mostly monocotyledonous plants: Maize streak virus (MSV) causes devastating crop losses in African countries, Wheat dwarf virus (WDV), but also infect dicotyledonous plants: Bean yellow dwarf virus (BeYDV), Tobacco yellow dwarf virus (TYDV) and Chickpea chlorosis virus (CpCV) , , . In 1997 the production of French beans (Phaseolus vulgaris cv. Bonus) was severely reduced in South Africa, mainly in the Northern Province and Mpumalanga District . Plants presented symptoms similar to a TYDV infection, which at the time was the only mastrevirus described to infect dicotyledonous plants. These symptoms included stunted growth, brittle and leathery leaves, and leaf curling. Investigating the aetiology of this disease were Liu and co-workers. They determined it was a geminiviral infection by identifying virus-like particles (VLPs) with the characteristic twinned morphology. They then sequenced DNA samples of the virus and found it to be most closely related to TYDV, both, in nucleotide sequence (65% identity) and in genomic organization. It was similar enough to be placed under the genus Mastrevirus but distinct enough to be considered a different virus. They Then called it Bean yellow dwarf virus – BeYDV . The genome of BeYDV (Figure 1) is 2,561 nucleotides long with an organization similar to that of other mastreviruses and that replicates by rolling circle mechanism , . Its genome is bidirectional, consisting of virion-sense open reading frames (ORFs) V1 and V2, and complementary-sense ORFs C1, C2, C3 and C4. Of these, only C3 and C4 are non-functional and non-conserved between the mastreviruses; although they are also present in TYDV , . Within the complementary sense ORFs C1 and C2 an intron is found which is also conserved in other mastreviruses. Virion sense and complementary sense ORFs are separated by a long intergenic region (LIR) and a small intergenic region (SIR) . Liu and co-workers described the functions of each component of the BeYDV genome by mutational analysis. The LIR contains a bidirectional promoter to which host factors can bind and a stem-loop structure within the origin of replication (ori) which is required for initiation of rolling circle replication. A binding site and nicking site for the replication associated protein (Rep) are also found in this region. The SIR in turn contains a primer binding region for initiation of complementary strand synthesis as well as transcription termination elements . These are the only two cis-acting elements required for BeYDV replication , . The V1 ORF encodes for the movement protein (MP) which is associated with plasmodesmata and is important for systemic spread of the virus. It was found to be a symptom inducer as transgenic plants expressing V1 developed wild type-like infection symptoms. The putative pathogen associated molecular pattern recognized by the host plant may be within the first 17 N-terminus amino acids as plants infected with a mutant developed wild type-like symptoms as well . The V2 ORF encodes for the capsid protein (CP) which is important for viral movement as well and therefore for systemic infection. Thus, intracellular movement or trafficking of the viral DNA may require encapsidation. This was suggested since V2 mutants did not infect plants systemically and also, a basic domain on the N-terminal of the CP was identified which putatively binds to DNA or is involved in nuclear localization , . From the genome of BeYDV, the complementary sense ORFs C1 and C2 are the most interesting for me. These encode two regulatory proteins involved in the replication of the virus: Rep and RepA. Their expression is regulated by alternate splicing, where spliced C1 and C2 (C1C2) mRNA is translated into Rep and unspliced C1 mRNA is translated into RepA . Rep is responsible for initiating rolling circle replication by nicking the stem-loop structure at the ori, and for releasing nascent virion sense single stranded DNA and later ligating it to form circular ssDNA molecules , . Rep is the only protein required for BeYDV replication, but in the presence of RepA the replication is more efficient , , . RepA is a multi-regulatory protein only found in mastreviruses . Even though both Rep and RepA, have a retinoblastoma related protein (RBR)-binding motif, LeuXCysXGlu, in BeYDV only RepA is able to bind to RBR proteins . In mammalian cells, the retinoblastoma protein is a tumor repressor that binds to and inactivates the transcription factor E2F. By binding to RBR proteins, RepA is thought to disrupt this interaction and force the plant cell cycle into the S-phase – where DNA is replicated just before cell division. RepA is thus acting like other viruses’ oncogenic proteins, such as the human papillomavirus E7 protein and the adenovirus E1A protein. Thus, keeping conditions favorable for enhanced viral replication and proliferation , . This could be seen when Hefferon and Dugdale mutated the RBR binding-motif of Rep and RepA to LeuXCysXGln. Only the RepA mutant showed significantly decreased replication. While the Rep mutant showed wild type-like replication . A leafhopper (which has not been identified yet) carrying the virus infects a host plant – this will be a dicotyledonous plant such as P. vulgaris, from which it was originally isolated. The virus releases its ssDNA genome into the cytoplasm. The ssDNA enters the nucleus where host’s replication machinery synthesizes the complementary strand from the primer located in the SIR region, generating a replicative double stranded circular DNA intermediate. At this point the dsDNA serves as template for gene expression, from which Rep and RepA are expressed. RepA transactivates virion-sense gene expression and interferes with plant cell’s life cycle to produce S-phase conditions. Rep nicks the stem-loop structure located at the ori and binds to the 5’ end of the nicked strand. The 3’ end acts as a primer for the synthesis of a new virion-sense strand displacing the previous virion-sense strand. When this new strand is complete, the ori is regenerated and Rep nicks it again. Subsequent release and recircularization of the nascent virion-sense strand is also mediated by Rep. The process continues on the new circular ssDNA molecules as well. Only later, when the amount of CP is high enough, ssDNA molecules are encapsidated. The CP and MP then mediate systemic spread of the viral genome , –. 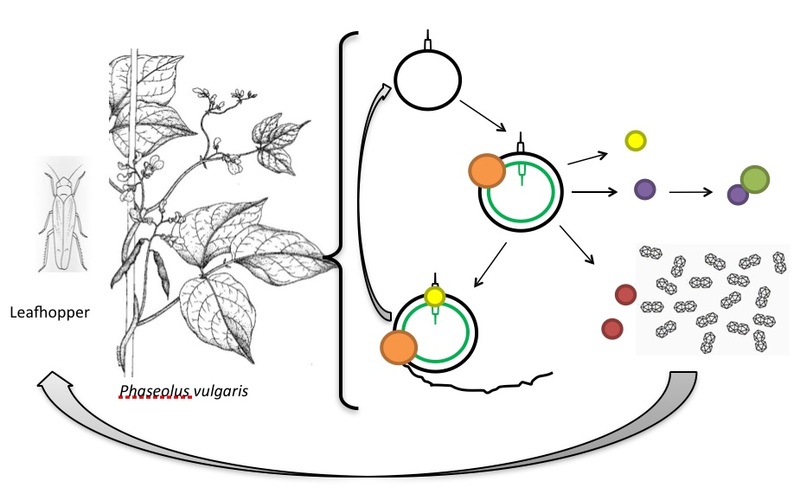 When another leafhopper visits the infected plant, the virus is transferred to other plants and all starts again (Figure 2). Figure 2. The life cycle of BeYDV. Black circle, BeYDV ssDNA with the stem-loop structure. Black and green circle, BeYDV dsDNA replicative intermediate. Orange spheres, plant host’s replication machinery. Yellow spheres, Rep protein. Black line, nascent ssDNA during rolling circle replication. Purple sphere, RepA. Green sphere, plant retinoblastoma-related protein. Red spheres, BeYDV movement protein. Geminal structures, BeYDV capsid proteins. Modified from , . Liu et al. (1997) and Halley-Stott et al. (2007) showed that BeYDV is able to infect other dicotyledonous plants besides P. vulgaris, such as: Nicotiana tabacum, N. benthamiana, Datura stramonium and Arabidopsis thaliana , . It has also been isolated from chickpeas in Pakistan . It was noted by Liu and co-workers that the intron of BeYDV (and TYDV) is not as AU-rich as intron sequences present in dicotyledonous plants, which suggested that these viruses had evolved from monocotyledonous-infecting ancestors . Other thing that suggests that BeYDV (and TYDV) evolved from monocotyledonous-infecting mastreviruses is that they encode for two variants of the Rep protein while other geminiviruses infecting dicotyledonous plants encode for only one Rep protein from a continuous ORF . I have talked about the relatively dark side of BeYDV as a crop pest and plant cell cycle manipulator. Now I would like to introduce you to the other face of this geminivirus. The importance of recombinant proteins in pharmaceutical, medical and research fields makes them highly demanded, which in turn requires the use efficient production systems , . Plants provide a cheaper, faster, more efficient and highly scalable platform for the production of proteins compared to other methods , . Vectors based on DNA viruses can be used to express complex proteins without the limitations and complexity faced by RNA viruses such as the need to use more than one virus construct, size constraint imposed on the insert and genomic instability , . BeYDV and other geminiviruses have small and simple DNA genomes which can be rapidly amplified to very high copy numbers using mainly host factors and that can be easily manipulated. These features make them attractive viruses for the design of plant vectors for the expression of recombinant proteins . BeYDV has been extensively explored as a molecular tool for the expression of mainly pharmaceutically relevant proteins, such as vaccines, antibodies and enzymes , . And recently it has also been used as a means to deliver reagents into plant cells to genetically engineer them . Hefferon and co-workers were one of the first to design a vector derived from BeYDV. They expressed a synthetic version of Staphylococcus enterotoxin B (SEB) in tobacco NT-1 cells. The synthetic SEB sequence was placed under the control of a Cauliflower mosaic virus (CaMV) 35S constitutive promoter and flanked by the cis acting BeYDV LIR and SIR. The Rep encoding gene was provided in trans from a separate construct and also constitutively expressed from the CaMV 35S promoter. Constructs were co-delivered into NT-1 cells by bombardment . They obtained expression levels of ≈0.025 mg SEB / kg of NT-1 cells. They showed that expression of SEB could be enhanced by 20 times by supplying Rep in trans compared to when no Rep was supplied. Overall they showed that BeYDV-based replicon systems promised enhancement of recombinant protein expression in plants . In a more deconstructed approach, Mor et al. (2003) designed a replicon system similar to that of Hefferon and Dugdale (2003) in which the BeYDV MP and CP genes were replaced by the gene of interest (GUS), controlled by CaMV 35S promoter and flanked by the LIR and SIR sequences . Since the CP can sequestrate viral ssDNA, preventing dsDNA to be formed , by removing the CP from the viral vector, expression levels can be increased. Removing non-essential features of the virus also gives more room for larger inserts and channels energy and building blocks that would be used to synthesize these proteins into expressing the recombinant protein . Mor et al. obtained expression levels 40 times higher when supplying Rep as well as RepA than when no Rep/RepA was supplied. Showing that RepA also enhances expression levels, probably by making the cell environment more favorable for replication . Regnard et al. (2010) designed a replicon vector, pRIC, based on the mild strain of BeYDV that contained the Rep/RepA coding regions in cis rather than in trans. This allowed the vector to autonomously replicate and thus generate high levels of gene copy number and in turn enhanced protein expression. They used N. benthamiana plants and Agrobacterium tumefaciens-mediated gene delivery. They obtained higher expression levels than previously described of three unrelated proteins: enhanced GFP, Human Papillomavirus type 16 major CP, L1, and a HIV-1 p24 antigen. Yields were higher when using the replicative vector than when compared to expression from a non-replicative A. tumefaciens expression vector: 550 mg ⁄ kg fresh leaf weight (FLW) vs. 337 mg L1 ⁄ kg FLW for L1 and 3.23 mg p24 ⁄ kg FLW vs. 0.95 mg p24 ⁄ kg FLW for p24. This study showed that autonomous replication of BeYDV-based vectors dramatically increases gene expression levels . Huang et al. (2009) designed a three-component replicon system that consisted of a construct derived from a deconstructed version BeYDV similar to that described by Mor et al. (2003) containing the gene of interest expression cassette, a construct encoding for the Rep/RepA under CaMV 35S promoter control and a construct expressing the posttranscriptional gene silencing suppressor protein P19. 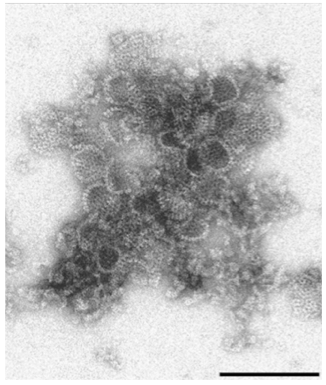 They obtained 0.34 g of Norwalk virus CP (NVCP) / kg FLW and 0.8 g of hepatitis B core antigen (HBc) / kg FLW, which were able to form VLPs. In order to simplify the replicon system, they included the Rep/RepA sequences in cis. They obtained similar expression levels when using the simplified replicon, with or without P19 supplementation as when the three-component system was used . Later they designed a single vector containing multiple replicon cassettes each flanked by a LIR and a SIR. The vector also contained the Rep/RepA sequences under LIR control. Co-delivering the single-vector replicon and a P19 expression vector, they expressed the light and heavy chain of an Ebola virus-targeting monoclonal antibody (mAB), 6D8. They obtained ≈0.5 g of 6D8 mAB / kg FLW which had been assembled correctly and could bind its antigen specifically. Expression levels were comparable to those obtained by Giritch et al. (2006)  using two vectors based on two non-competing RNA viruses. They speculated that using this single-vector multireplicon system, even four proteins could be expressed simultaneously using two vectors or placing expression cassettes in tandem . More recently, Moon et al. (2014) were able to express Brome mosaic virus (BMV) and Cucumber mosaic virus (CMV) VLPs at 0.5 and 1.0 g / kg FLW respectively, using a BeYDV-derived single-vector replicon system. This vector included the P19 coding sequence, the gene of interest as well as the Rep/RepA coding sequences in the same backbone. In this way enhanced expression of VLPs that can be used as carriers for nano-platforms with applications in material sciences and medicine was possible with only one agroinfiltration . Finally, Baltes et al. (2014) demonstrated that BeYDV-based replicon system can be also used for plant genome engineering. They were able to deliver various nucleases (TALENs and CRISP/Cas system) as well as repair templates into tobacco cells and to regenerate plantlets with the desired DNA changes within 6 weeks. This highlighted the potential of vectors derived from BeYDV and other geminiviruses to be applied in the engineering of plants for, for example, improvement of crop characteristics, crop resistance or in fundamental biology studies . In conclusion, BeYDV is a small, dicotyledonous plant-infecting mastrevirus with apparently unlimited possible molecular applications. W. Zhang, N. H. Olson, T. S. Baker, L. Faulkner, M. Agbandje-McKenna, M. I. Boulton, J. W. Davies, and R. McKenna, “Structure of the Maize streak virus geminate particle.,” Virology, vol. 279, pp. 471–477, 2001. E. P. Rybicki and D. P. Martin, “Virus-derived ssDNA vectors for the expression of foreign proteins in plants,” Current Topics in Microbiology and Immunology, vol. 375, pp. 19–45, 2011. A. Varsani, J. Navas-Castillo, E. Moriones, C. Hernández-Zepeda, A. Idris, J. K. Brown, F. Murilo Zerbini, and D. P. Martin, “Establishment of three new genera in the family Geminiviridae: Becurtovirus, Eragrovirus and Turncurtovirus,” Archives of Virology, vol. 159, pp. 2193–2203, 2014. L. Liu, T. Van Tonder, G. Pietersen, J. W. Davies, and J. Stanley, “Molecular characterization of a subgroup I geminivirus from a legume in South Africa,” Journal of General Virology, vol. 78, pp. 2113–2117, 1997. J. Hadfield, J. E. Thomas, M. W. Schwinghamer, S. Kraberger, D. Stainton, A. Dayaram, J. N. Parry, D. Pande, D. P. Martin, and A. Varsani, “Molecular characterisation of dicot-infecting mastreviruses from Australia,” Virus Research, vol. 166, no. 1–2, pp. 13–22, 2012. R. P. Halley-Stott, F. Tanzer, D. P. Martin, and E. P. Rybicki, “The complete nucleotide sequence of a mild strain of Bean yellow dwarf virus,” Archives of Virology, vol. 152, pp. 1237–1240, 2007. K. E. Palmer and E. P. Rybicki, “The molecular biology of mastreviruses.,” Advances in virus research, vol. 50, pp. 183–234, 1998. L. Liu, J. W. Davies, and J. Stanley, “Mutational analysis of bean yellow dwarf virus, a geminivirus of the genus Mastrevirus that is adapted to dicotyledonous plants,” Journal of General Virology, vol. 79, pp. 2265–2274, 1998. Q. Chen, J. He, W. Phoolcharoen, and H. S. Mason, “Geminiviral vectors based on bean yellow dwarf virus for production of vaccine antigens and monoclonal antibodies in plants,” Human Vaccines, vol. 7, no. 3, pp. 331–338, Mar. 2011. L. Liu, K. Saunders, C. arole L. Thomas, J. W. Davies, and J. Stanley, “Bean yellow dwarf virus RepA, but not rep, binds to maize retinoblastoma protein, and the virus tolerates mutations in the consensus binding motif.,” Virology, vol. 256, pp. 270–279, 1999. 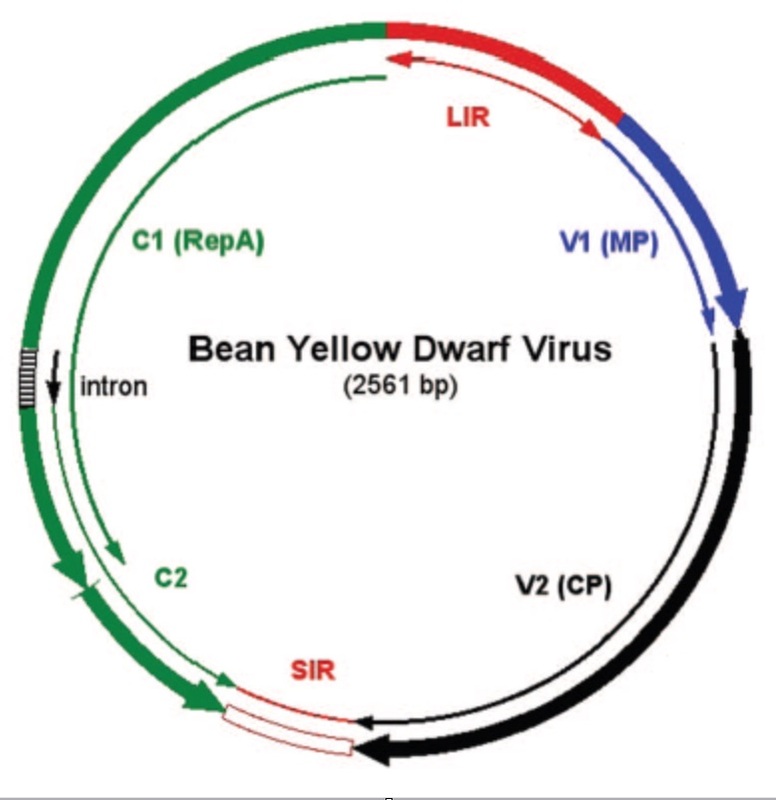 K. L. Hefferon and B. Dugdale, “Independent expression of Rep and RepA and their roles in regulating bean yellow dwarf virus replication,” Journal of General Virology, vol. 84, pp. 3465–3472, 2003. C. Gutierrez, “Geminivirus DNA replication,” Cellular and Molecular Life Sciences, vol. 56. pp. 313–329, 1999. “Adult drawing grape leafhopper,” Koppert Biological Systems 9103. [Online]. Available: https://www.flickr.com/photos/koppert/2400156751/. [Accessed: 09-Feb-2015]. “Phaseolus vulgaris,” Belgium, Prelude – Royal Museum for Central Africa – Tervuren. [Online]. Available: http://www.africamuseum.be/collections/external/prelude/view_plant?pi=09910. [Accessed: 09-Feb-2015]. N. Nahid, I. Amin, S. Mansoor, E. P. Rybicki, E. Van Der Walt, and R. W. Briddon, “Two dicot-infecting mastreviruses (family Geminiviridae) occur in Pakistan,” Archives of Virology, vol. 153, pp. 1441–1451, 2008. G. Pogue and S. Holzberg, “Transient Virus Expression Systems for Recombinant Protein Expression in Dicot-and Monocotyledonous Plants,” in Plant Science, N. K. Dhal and S. C. Sahu, Eds. InTech, 2012, pp. 191–216. F. Sainsbury, P.-O. Lavoie, M.-A. D’Aoust, L.-P. Vézina, and G. P. Lomonossoff, “Expression of multiple proteins using full-length and deleted versions of cowpea mosaic virus RNA-2.,” Plant biotechnology journal, vol. 6, no. 1, pp. 82–92, Jan. 2008. E. P. Rybicki, “Plant-produced vaccines: promise and reality.,” Drug Discovery Today, vol. 14, no. 1–2, pp. 16–24, Jan. 2009. V. Yusibov, S. Rabindran, U. Commandeur, R. M. Twyman, and R. Fischer, “The potential of plant virus vectors for vaccine production.,” Drugs in R&D, vol. 7, no. 4, pp. 203–17, Jan. 2006. Y. Gleba, S. Marillonnet, and V. Klimyuk, “Plant Virus Vectors: Gene Expression Systems,” Encyclopedia of Virology, vol. 4, pp. 229–237, Apr. 2008. K. L. Hefferon, “DNA Virus Vectors for Vaccine Production in Plants: Spotlight on Geminiviruses,” Vaccines, vol. 2, no. 3, pp. 642–653, Aug. 2014. N. J. Baltes, J. Gil-Humanes, T. Cermak, P. a Atkins, and D. F. Voytas, “DNA replicons for plant genome engineering.,” The Plant cell, vol. 26, no. January, pp. 151–63, 2014. K. L. Hefferon and Y. Fan, “Expression of a vaccine protein in a plant cell line using a geminivirus-based replicon system,” Vaccine, vol. 23, pp. 404–410, 2004. T. S. Mor, Y.-S. Moon, K. E. Palmer, and H. S. Mason, “Geminivirus vectors for high-level expression of foreign proteins in plant cells.,” Biotechnology and bioengineering, vol. 81, pp. 430–437, 2003. G. L. Regnard, R. P. Halley-Stott, F. L. Tanzer, I. I. Hitzeroth, and E. P. Rybicki, “High level protein expression in plants through the use of a novel autonomously replicating geminivirus shuttle vector.,” Plant biotechnology journal, vol. 8, no. 1, pp. 38–46, Jan. 2010. Z. Huang, Q. Chen, B. Hjelm, C. Arntzen, and H. Mason, “A DNA replicon system for rapid high-level production of virus-like particles in plants.,” Biotechnology and bioengineering, vol. 103, no. 4, pp. 706–14, Jul. 2009. A. Giritch, S. Marillonnet, C. Engler, G. van Eldik, J. Botterman, V. Klimyuk, and Y. Gleba, “Rapid high-yield expression of full-size IgG antibodies in plants coinfected with noncompeting viral vectors.,” Proceedings of the National Academy of Sciences of the United States of America, vol. 103, no. 40, pp. 14701–6, Oct. 2006. Z. Huang, W. Phoolcharoen, H. Lai, K. Piensook, G. Cardineau, L. Zeitlin, K. J. Whaley, C. J. Arntzen, H. S. Mason, and Q. Chen, “High-level rapid production of full-size monoclonal antibodies in plants by a single-vector DNA replicon system.,” Biotechnology and bioengineering, vol. 106, no. 1, pp. 9–17, May 2010. K. Moon, J. Lee, S. Kang, M. Kim, H. S. Mason, J. Jeon, and H. Kim, “Overexpression and self-assembly of virus-like particles in Nicotiana benthamiana by a single-vector DNA replicon system.,” Applied microbiology and biotechnology, vol. 98, pp. 8281–90, 2014. I should have known Alan Cann would find this one; it’s just too good to miss – so I am going to add to what he said, as a way of further exploring what they could/should have done, as a result of discussions in our Journal Club this morning. Our major defense against infection with influenza viruses is immunization of individuals with an annually updated vaccine that is currently produced in chicken eggs, with a global annual capacity of about 400 million doses, a scale of production insufficient to combat a pandemic. 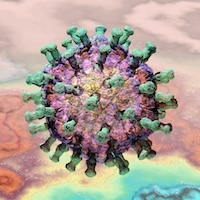 Furthermore, at least six months is required between the identification of new virus strains to be included in the vaccine formulation and the manufacture of bulk quantities. Uncertainties over the robustness of egg-based vaccine production are intensified even further by the emergence of H5N1 strains that are highly virulent to both chickens and eggs. There is a need to develop alternative vaccine production systems capable of rapid turnaround and high capacity. Recombinant subunit vaccines should circumvent some of the concerns regarding our current dependence on egg-based production.This paper reports on the production and evaluation of domains of influenza haemagglutinin (HA) and neuraminidase (NA) fused to the thermostable enzyme lichenase. All vaccine targets were produced using a plant-based transient expression system (Nicotiana). When tested in ferrets, vaccine candidates containing these engineered plant-produced influenza HA and NA antigens were highly immunogenic, and were protective against infection following challenge with homologous influenza virus. This plant-based production system offers safety and capacity advantages, which taken together with the protective efficacy data reported, demonstrates the promise of this approach for subunit influenza vaccine development. There are a couple of interesting features of this paper, chief among them being the complete obscurity of the reasons why they use lichenase fusions, and what exactly their “launch vector” – which is what they use to express their proteins transiently – is. Because the reference they give is incorrect – it is to a journal they erroneously call “Influenza”, which is not listed by PubMed, and turns out to be Influenza and Other Respiratory Viruses in fact – and is unavailable at our institution. I am assuming, given the system uses a CaMV 35S promoter to drive RNA production, and they talk of “viral replication and target sequence expression from the [TMV] CP subgenomic mRNA promoter”, that the vector is a TMV-based replicon. I was alerted by colleagues at the Journal Club to the fact that the same group used the same system – pBID4 “launch vector”, fusions to lichenase – for production of a HPV E7 vaccine in plants. And referred to the same paper as this one does, for the vector and constructs. Aargh! I still don’t know why lichenase fusions are such a good idea!! A hint is given in the E7 paper: they say that “…these LicKM fusion proteins alone are able to activate both innate and adaptive antigen-specific immune responses”. But they found in the paper under discussion here that alum was needed to get the best response…and they got the best yield AND immunogenicity out of their NA protein, which was expressed as a (presumably) soluble truncated native protein. So the reason is still obscure. The purification section of this paper is also woefully inadequate: saying “…recombinant antigens were enriched by ammonium sulphate precipitation followed by immobilised metal affinity chromatography and anion exchange chromatography, with dialysis after each step, to at least 80% purity” is NOT a method! It is an anecdote, fit for a 1-minute talk maybe, but NOT for the Methods section of a paper. Naughty, naughty! Another interesting thing is the complexity of the vaccine constructs – again, exactly the same type of constructs as made for HPV E7; assembly-line vaccine producers, these guys! These consist of the Gene of Choice (GoC) with a poly-His tag AND a KDEL (ER retention) tag at the C-terminus, AND the signal sequence of Nicotiana tabacum PR1a protein at their N-terminus. This means (a) proteins get into the ER lumen, (b) get retained in the ER, (c) can be purified by Ni or other metal affinity column. In addition to being fused to LickM. Granted, the PR1 signal sequence is lost and the His tags can be removed – but the proteins still have significant “other” constituents – which is rather frowned on in a vaccine intended for humans. I am also interested that they did not do the standard thing with their plant-produced HA GD protein and test for haemagglutination / RBC binding: this was in any case superseded by the fact that the vaccines were protective and antisera elicited by them worked in HI [haemagglutination-inhibition] assays, but it has long been regarded as a necessary first step. I like these guys’ approach: forget the biochemistry; let’s see if it works! All in all, a good paper despite our criticisms, which points up the very distinct possibility of being able to use plant production of influenza virus antigens for the rapid production of effective vaccines. But I wish they’d included some more details….